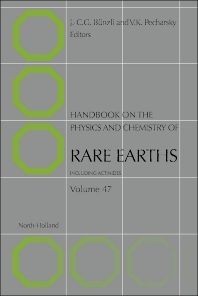 Handbook on the Physics and Chemistry of Rare Earths is a continuing series of books covering all aspects of rare earth science, including chemistry, life sciences, materials science, and physics. The handbook emphasizes rare earth elements [Sc, Y and the lanthanides (La through Lu)] but, when relevant, information also is included about the closely related actinide elements. The individual chapters are comprehensive, broad, up-to-date critical reviews written by highly experienced invited experts. The series, which was started in 1978 by Professor Karl A. Gschneidner, Jr., combines and integrates both the fundamentals and applications of these elements and now publishes two volumes a year. Covers all aspects of rare earth science, including chemistry, life sciences, materials science, and physics.